My wife likes to can food of all types. 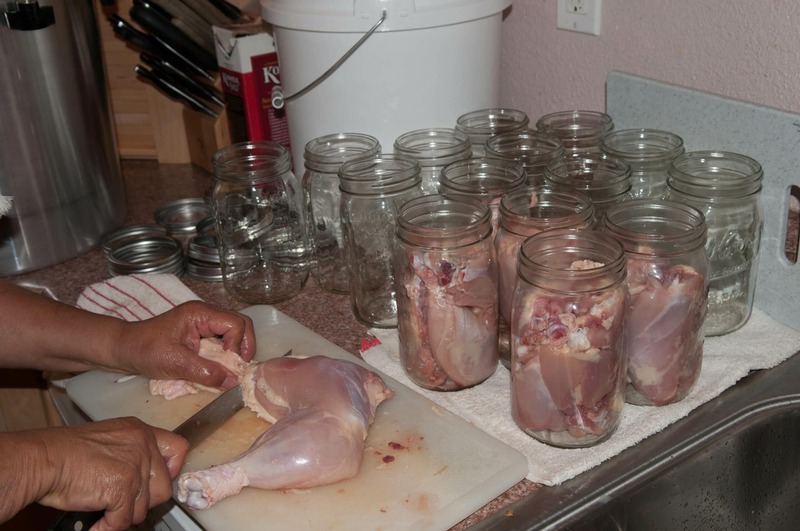 One thing that we have had good success with is canning meat. One of her favorites is to can chicken. It is one of the more inexpensive meats and yet one of the more versatile, when it comes time to cook. She makes curries, Mexican foods and all kinds of casseroles and stir-fries from canned chicken. Here is her recipe for canned chicken. We like dark meat on chicken and turkey. I get the skinless chicken thighs, if they are not too expensive or on sale. I also get turkey thighs. Usually I end up getting the ones with skin and bone-in because they are cheaper. Just take the skin and fat off and debone the meat from the thigh, the legs are to hard to debone. Canning boneless chicken saves time when you are ready to cook. I like using boneless chicken when I am in a hurry for curry; I just dump the jar in a pan and cook. There are two ways to can the chicken. Hot pack– Boil, steam or bake meat until about two-thirds done. Add 1 tsp salt per quart to a jar, if desired. Fill hot jars with pieces and hot broth, leaving 1 ¼ inch head space. Remove air bubbles. The process and times stated are for a dial-gauged pressure canner. The process and times stated are for a weighted-gauge pressure canner. This entry was posted in preserving foods, recipes and tagged canned chicken. Bookmark the permalink. Canned boneless/skinless chicken breasts make a mean chicken pot pie, too! We can meats also, we can just about anything! Funny the post on canning chicken. This morning I happen upon your blog, (I bookmarked it for later reading tonight). I made my wife chicken salad with crackers for part of her lunch at work today from chicken we had canned last year. We’ve found our canned chicken to be so tender and it doesn’t have that “off-taste” the grocery store canned chicken has and as a bonus I can identify the cut of the bird unlike the “mystery meat in a can” from the store. Pints work best for us for lunches and small additions to recipes but we do process quarts for larger family meals. Save some money, know what’s in your food, develop a skill that feeds you and your loved ones and it’s insurance for your future. How can you loose? I just finished a run of canned chicken & got online to rest a few minutes!! 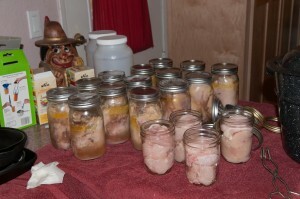 I have been canning meats for at least 30+ yrs. Chicken is also the one I can most. I can it bone in and skin on. The skin can be used as a pet food treat. The bone adds a lot of flavor to the broth. I like to do turkey, too. I think canned turkey is better than roasted. The legs are too long, so I cut the knuckle end off with a hacksaw. The breast is good in large cuts or diced like stew meet. No more dry turkey breast! I use sea salt instead of ‘canning’ salt. No cloudiness. great details. we did the same thing with meat chickens we raised and it was very nice. another thought – we found our favorite canned chicken was to buy 5 or 6 roticcery chickens at costco and to can them in an afternoon. far less expensive (and quicker) than raising them, already cooked, and easy to bone and bottle.